1. Begin by painting a coat of DecoArt Chalky Paint- Escape onto your pegs, leave to the side to dry. Paint on another layer to get full coverage. 2. Pick a First Edition Decoupage paper design and cut a small strip that is long enough to fit your peg. Place it onto your peg and mark the width of the peg. Repeat this step until you have 6 separate strips. TIP Maxine has cut her decoupage paper strips from a specific area so that the bird design flows through her pegs, it’s up to if you would like to do this too! 3. In your First Edition brush set, you will have two brushes. Use the firm hog hair brush to apply your First Edition Deco Mache Adhesive Varnish & Glue to the peg and then layer on a paper strip to your peg as the bristles will help you get a flat finish. 4. Apply another layer of glue and use the soft, nylon brush to achieve a smooth and varnished look on your peg. Repeat step 3 & 4 on all of your pegs and then leave to dry. 5. Cut a piece of Dovecraft white card down to 7.5cm x 3cm. Adhere a coordinating piece of First Edition Deco Mache paper to the card with Dovecraft Perma Fix tape. 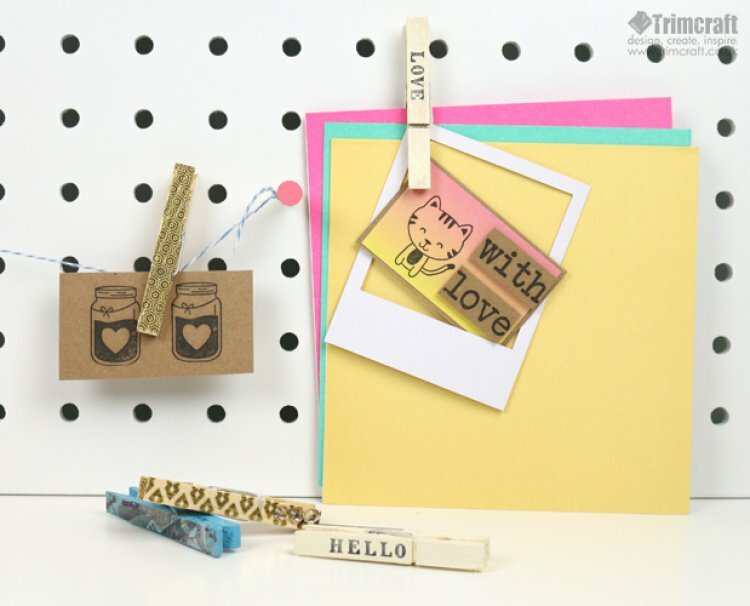 Write a note on the back for a friend and add your pegs to your card, this will make a lovely gift! For an alternative look, you could apply your favourite Dovecraft Washi tape designs and Simply Creative Gems to your pegs, this metallic look will add a lovely shine around the home! If you’re looking for a sweet and simple look, you could stamp a fun sentiment on your pegs using the Simply Creative Alphabet Serif stamps. How will you personalise your pegs? Show us your upcycled makes in the project gallery and when uploading to social media, don't forget to #Trimcraft!